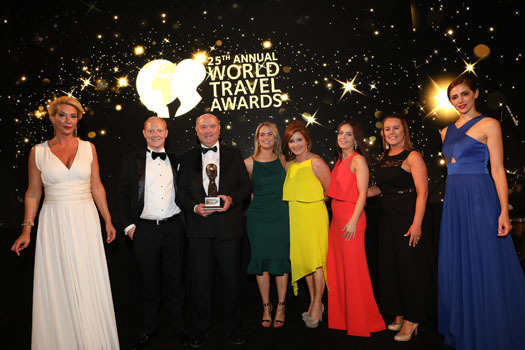 Dublin’s Sandymount Hotel, Convention Centre and Jameson Distillery tour have won accolades at the European Leg of this year’s World Travel Awards, held in Athens, with Irish software firm Datalex being named Europe’s Leading Travel Technology Provider. The family-run Sandymount Hotel won the ‘Europe’s Leading Green Hotel’ prize for a second year running, beating competition from the ICE Hotel in Sweden, Vila Vita Parc in Portugal and Hotel Metropole Monte-Carlo in Cannes. The anniversary World Travel Awards Europe 2018 red-carpet event took place Sunday July 1 at the Zappeion Megaron Hall in Athens for the European awards categories. John and Gerard Loughran, family directors at Sandymount Hotel, were joined by their wives and colleagues, Ciara Kelly (Marketing Manager) and Ann McCabe (Green Team leader), to celebrate their win. The team said that “2017 was a successful year for us; achieving a 4-star upgrade from Fáilte Ireland following significant refurbishment and winning this award for the first time. Heading into 2018, we wanted to ensure we progressed our eco-friendly and sustainable approaches and have a ‘green’ team in place at the hotel”. Now 95pc of the hotel’s waste is recycled and it uses biodegradable compostable coffee cups and lids. It also uses eco-friendly straws, and has modern heating and lighting systems. James Distillery won the the Leading Distillery tour prize, while Dublin’s Convention Centre won the Leading Meetings and Conference Centre prize. Elsewhere, Lufthansa was named Europe’s Leading Airline and Zurich was voted top airport, while Portugal won a series of prizes, for best tourist board, city destination (Lisbon) and Leading Airline to Africa and South America (TAP Air Portugal). The 570 awards also named best attractions and operators by country. The winners for Ireland were: Dromoland Castle (Leading Boutique Hotel 2018); The Shelbourne (Leading Business Hotel); Avis (Leading Car Rental Company); Adare Manor (Leading Hotel); Presidential Suite at Conrad Dublin (Leading Hotel Suite); and Conrad Dublin (Leading Luxury Hotel). The winners for the north were Titanic Hotel Belfast (Leading Hotel) Radisson Blu Hotel, Belfast (Business Hotel) Avis (Car Rental Company) and Dream Apartments (Serviced Apartments).